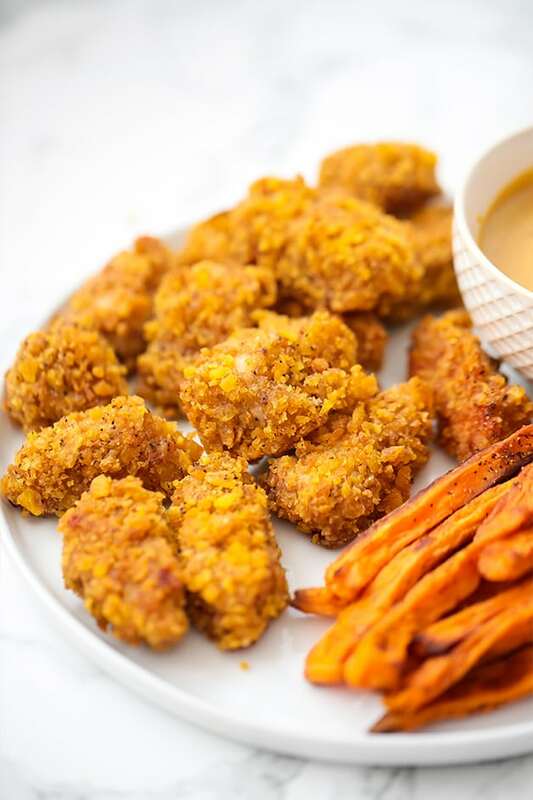 These paleo crispy chicken nuggets are the ultimate chick-fil-a copycat, complete with a honey mustard dipping sauce. Plus, they’re even AIP compliant, and made without eggs! There are some meals that I had resided in my mind that I’d just never eat again. Chick-fil-a chicken nuggets were one of them. With all of the ingredients that I knew just didn’t make me feel great, it didn’t seem worth it to even think about it anymore. But, never say never! 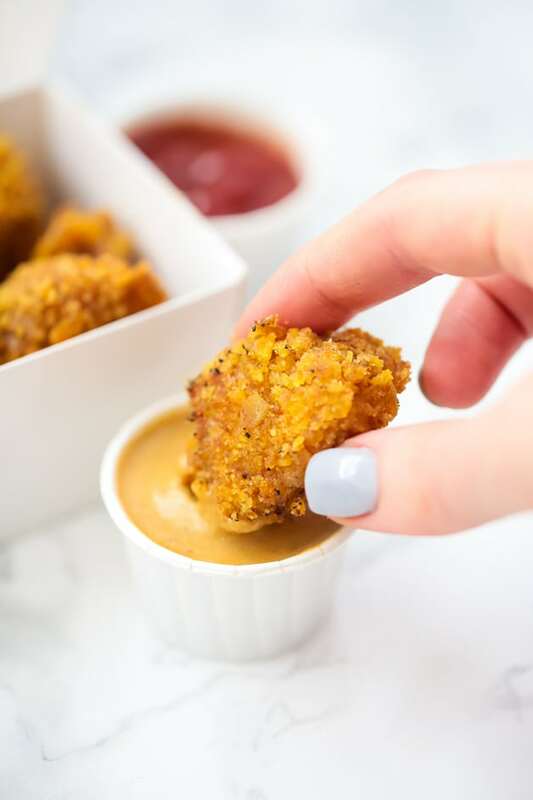 I’m a firm believer that you can do anything you put your mind to… even make a paleo and AIP version of crispy, chick-fil-a style chicken nuggets with signature chick-fil-a sauce! I’ll be the first to admit that I didn’t think it could be done to where it was actually a believable knockoff, but after I watched my husband eat an entire batch of these crispy chicken nuggets and beg for more, I did a little happy dance! 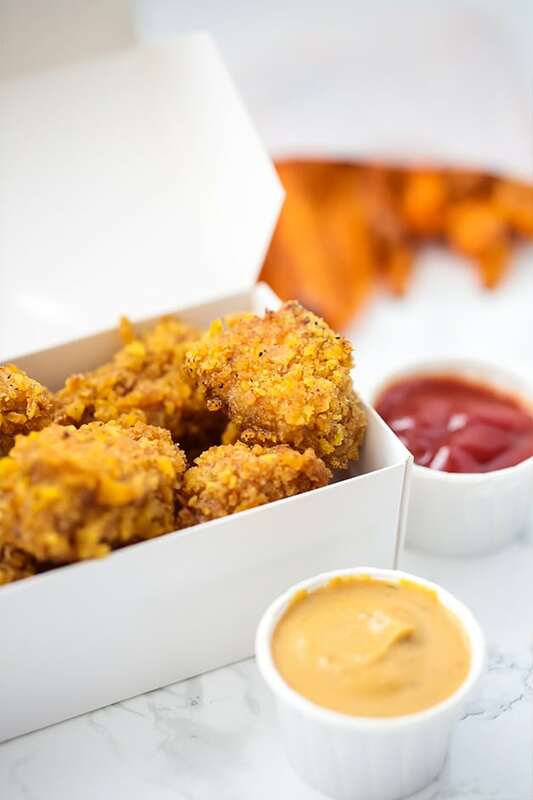 These chicken nuggets are crispy, packed with flavor, and taste just like the real thing when you dip them into the knock off chick fil a sauce! Chicken breast is what I used to make the nuggets, but you can try to use thigh if that’s what you prefer. The crispy breading! You can use homemade plantain chips, or store-bought. Just be sure to watch the oils. This more of less creates a buttermilk to marinate the chicken in. It locks in so much flavor and allows the plantain chips to stick better without any eggs. This helps the plantain chips stick, and keep the chicken moist. This is basically a ranch style seasoning to really up the flavor of the nuggets. You can easily tone it down, but I think it adds a lot! Omit the pepper if you’re AIP. These are the ingredients for the chick-fil-a sauce knockoff. This is the AIP mustard that I used, and the AIP BBQ sauce. You can try to make homemade versions, or you can use something else if you’re not AIP… this was just the easiest option! Preheat the oven to 400 F and prepare a large baking sheet with parchment paper. Combine the coconut milk and apple cider vinegar in a bowl and add the chicken. Place in the fridge to marinate for 30-60 minutes. Drain the excess milk when the chicken is done marinating. Using a food processor, grind the plantain chips until fine. Pour the ground plantain chips in a bowl, combine with the seasonings and set aside. Set up a station with the plantain mixture in one bowl, and coconut oil in another bowl. Use tongs to dip the chicken pieces one by one into the coconut oil, and then coat in the plantain mixture. Place the coated chicken nuggets on the baking sheet and repeat the process until all are coated. Bake the chicken for 20-25 minutes, flipping once. Serve with the sauce and enjoy!! Combine all of the ingredients in a small bowl and whisk together. Adjust ingredients to taste as desired. i’m so excited to try this recipe!! do you use canned coconut milk OR something in a carton? thanks for your help! Thank you Beth!! I liked canned coconut milk from Nature’s Forest or Trader Joes. I have to say, I was skeptical at first–particularly about the Chick-fil-a sauce. But all of it was so tasty! This is definitely one of those meals you don’t feel like you’re missing out on anything. Thank you! Thank you SO much Oliva!! I’m so happy that you liked it! Hello. I am curious why you are stating to leave out black pepper for AIP? It is not a nightshade. And every other site I have researched says black, pink and white pepper are AIP friendly. Curious on your reasons. Thank you! Black pepper actually isn’t AIP friendly as it’s a seed spice. You can find more details on that here. These are INCREDIBLE!! A new favorite for my whole family! Just wondering if you have tried making them in bulk to freeze? If I bake them and then freeze them, will they remain crispy reheated in the oven? Thanks again for a wonderful recipe! Hello! I’m battling SIBO and am doing low FODMAP so was wondering if instead of plantain ships i could use almond or coconut flour?….thanks! Is there any harm in marinating the chicken for longer than 60 min? Just curious if I can prep the chicken in the morning to save time in the evening. How long would these last in the fridge? 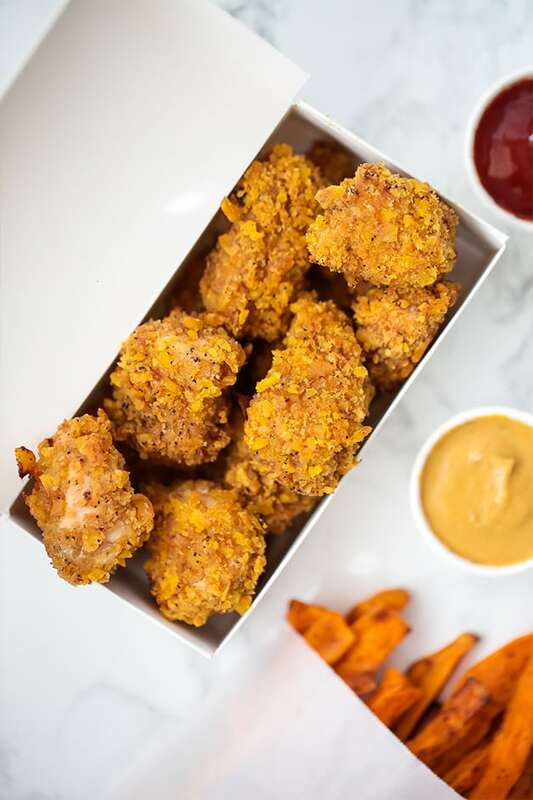 My kids love nuggets for lunch a few times a week on busy days but if want to make sure they would stay well for 4 to 5 days.. Could you possibly even make a bigger batch and freeze them? YAY! I’m so happy you liked them! Thank you so much!! 5/5 These are amazing and I can’t wait to make them again!! !